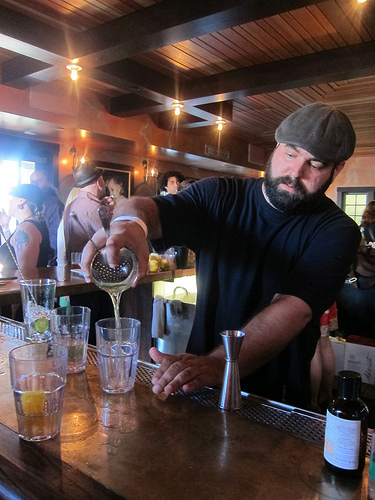 The event was a showcase of local bartenders’ other talents which included music, art and magic. 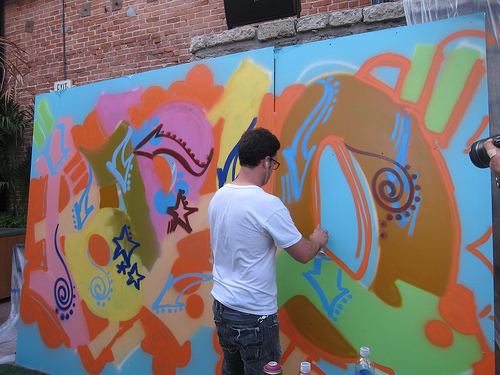 Proceeds benefited Inner-City Arts. I got to Sadie where Art Beyond the Glass was held and was greeted by Matt Biancaniello and his Never Let Me Go drink. The Cynar, Creme de Cassis and blood orange drink was refreshing after a brief wait in the hot sun (tickets were even burning!). 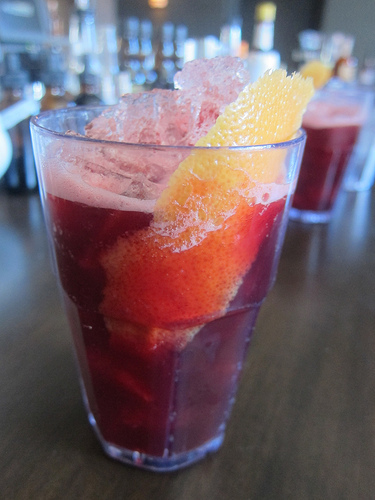 Check out Matt’s recipe on Thirsty in LA’s post. 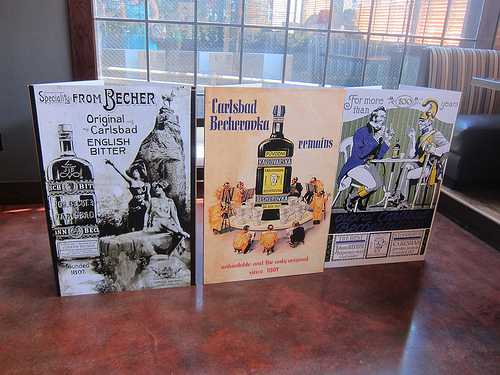 The front parlor had vintage posters of Becherovka which later served as the DJ stand. 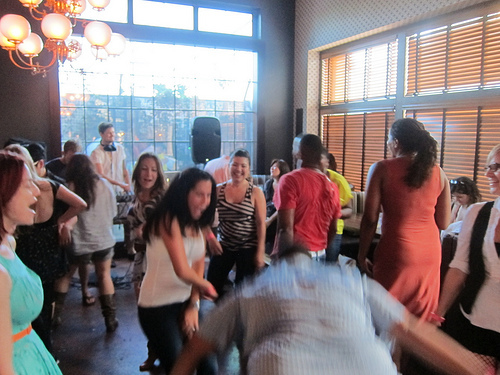 This room erupted into a wild dance party that my knees didn’t thank me for later. 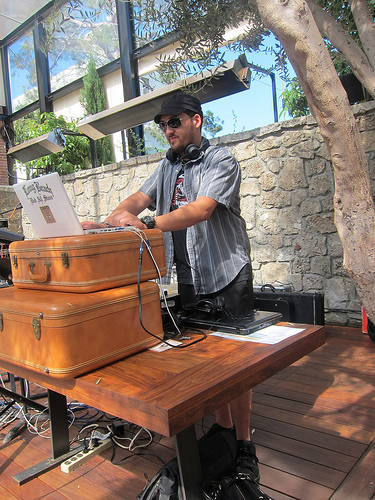 The first DJ I heard out back was Allan Katz, bar manager at Cana Rum Bar. I enjoyed the cocktail by Jason Schiffer from 320 Main. It featured St. George Terroir gin and their absinthe which I also really like. Check out the recipe on Thirsty in LA. 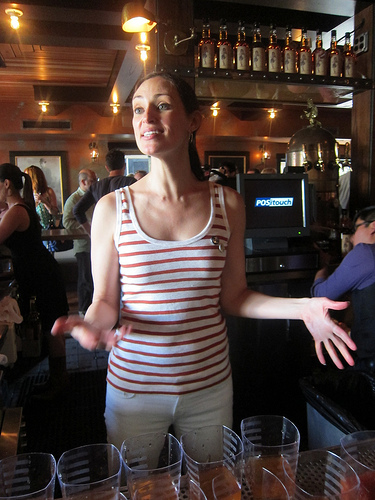 Mia “Tall Mia” Mastroianni, the head bartender from SoHo House helped out the other Mia, Mia Sarazen at the Sailor Jerry corner. 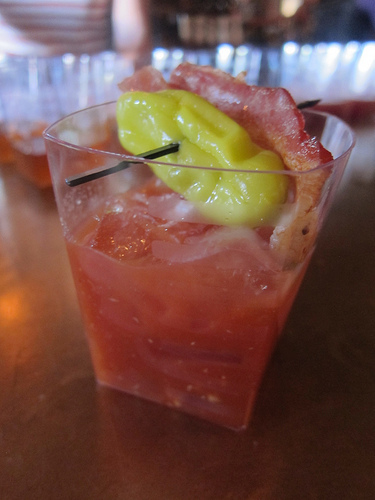 I was blown away by the Sailor Jerry Bloody Mary. The bacon was even cooked with the same spices used in Sailor Jerry. 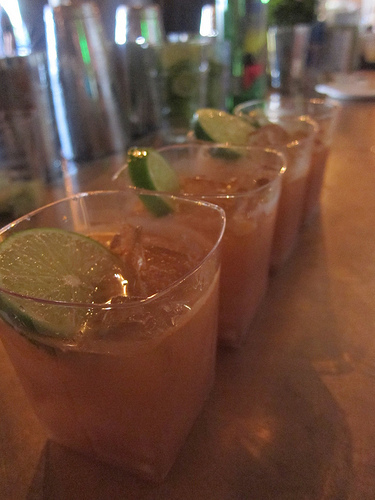 The Lil’ Twisted Sangrita Tour with Cari Hah and Jaymee Mandeville arrived at Sadie. 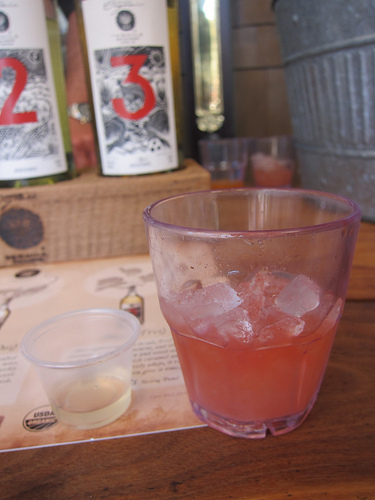 Along with 123 Tequila, their sangrita was one of the favorites of the day. It’s always a good time with bartender Ricky Yarnell who mixed up his Faultline Old Fashioned with St. George Bontanivore gin, chrysanthemum syrup, rosemary water mist and Miracle Mile orange bitters. 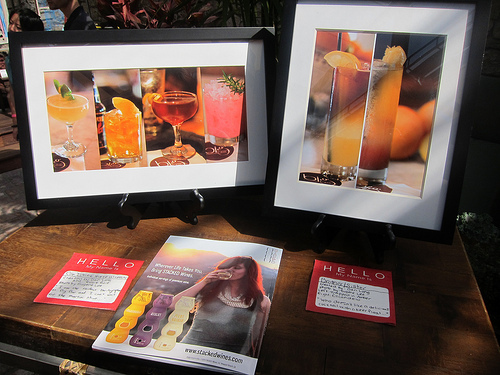 There were many great auction items including paintings and prints of gorgeous cocktails. I was particularly intrigued by graphic style of China Morbosa from Eveleigh. Every time I walked by, Tlapazola Grill’s Edwin Cruz was making something new but he also had jello shots. 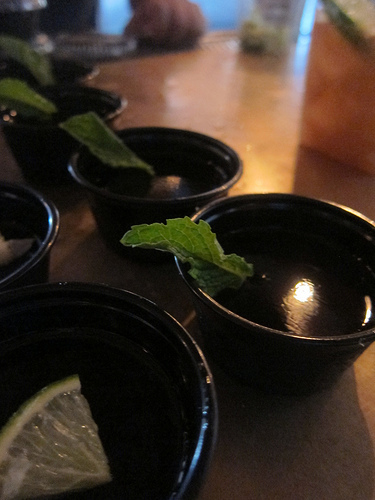 My favorite was the mezcal Mai Tai jello shot. One of the favorite cocktails of the day was Lindsay Nader’s Awesome Possum. Anything with Scotch gets me going. 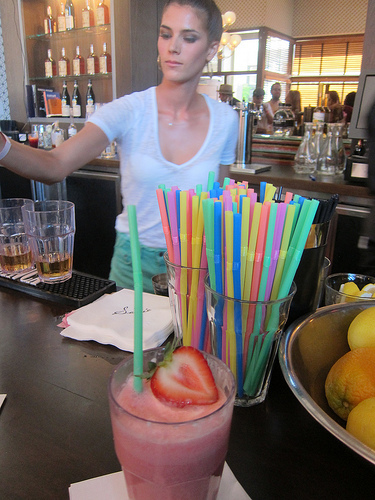 The boozy shake was made with Auchentoshan, strawberry soda, vanilla ice cream and topped with a strawberry. 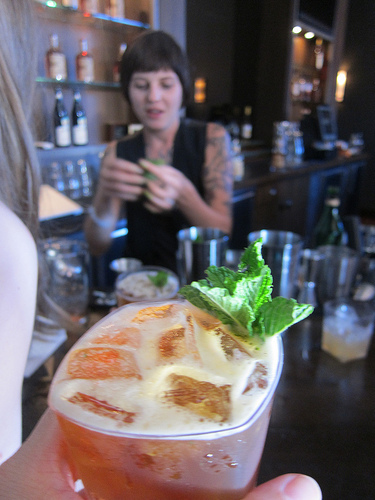 My ultimate favorite drink of the day was the Fernet Mint Julep from China Morbosa. It probably is cheating to like a drink with Fernet in it. 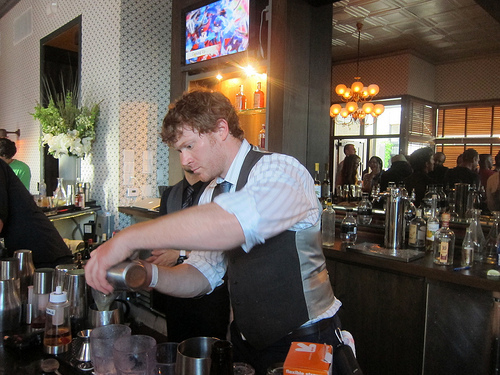 LA’s Best Bartender Justin Pike tending bar in the front Parlor. 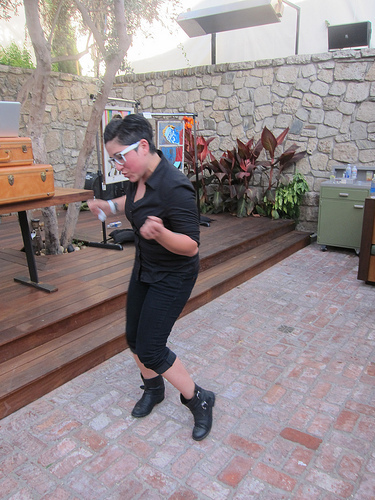 Rosie from Big Bar getting down on the back patio was one of my favorite things ever from the day. As mentioned the front Parlor was the place to be. 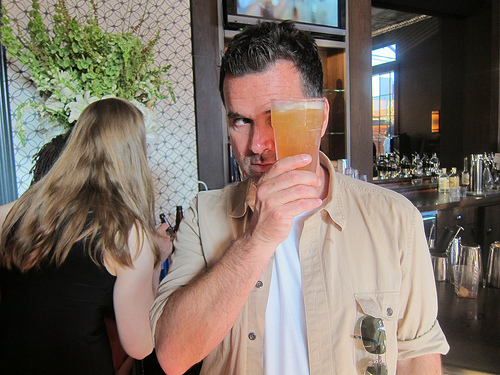 And our favorite Imbiber, Dan Dunn looking dapper with his drink at Art Beyond the Glass. I heard rumors of Art Beyond the Glass traveling to Portland Cocktail Week (gosh, I hope it’s true) but until then, I eagerly await for the next one in L.A. 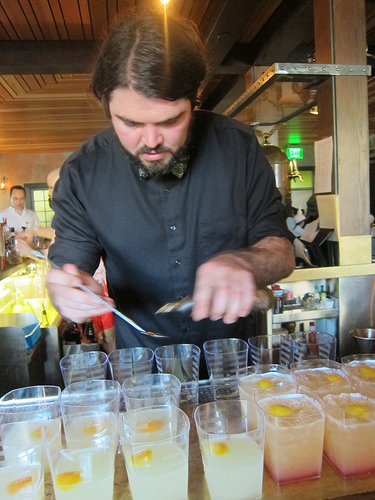 Thanks to Daniel and Zahra for putting out the best cocktail event in the summer in L.A. And thanks to all the talented bartenders who either slung drinks or showed off their other considerable talents. 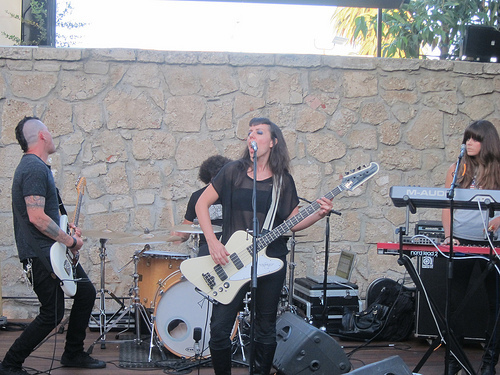 Check out the following links for some music videos! 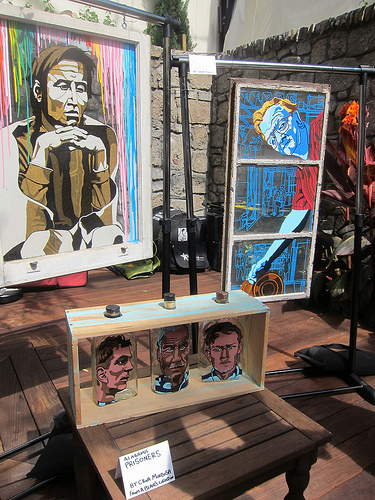 See all photos from Art Beyond the Glass here. This entry was posted in bar stories, bars, bartenders, cocktails, events, history, hot bartenders, la, la cocktails, los angeles, the minty and tagged alcohol tasting, art beyond the glass, artists, bartenders, booze, dance party, daniel djang, hollywood, hot bartenders, magician, musicians, painters, party, providence, sadie, showcase, singers, talented bartenders, thirsty in la, zahra bates. Bookmark the permalink.